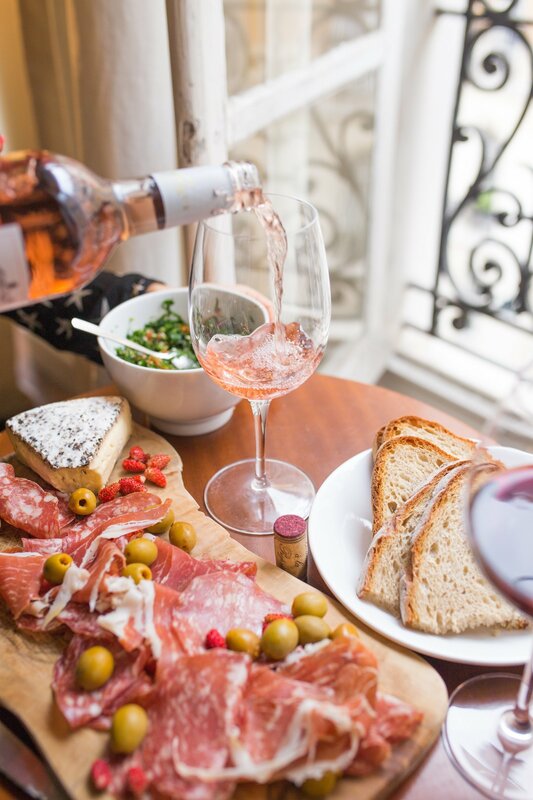 As I’m sitting here writing this, my kitchen is filled with the scents and flavors of Fall. It’s warm, and the smell of butternut squash and spices are floating throughout. I’m welcoming Fall with seasonal flavors, and comforting dishes. 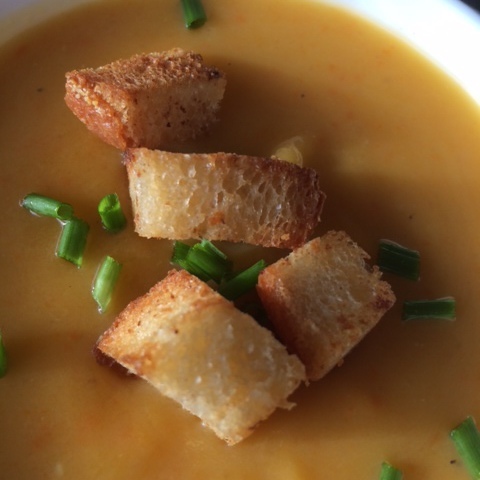 This Butternut Squash Soup with Apples does just that – warms and comforts. Even though it is still 80-90 degrees here in Florida, I like to pretend I’m back in New England and the leaves are starting to change and my cashmere sweater is keeping me warm. 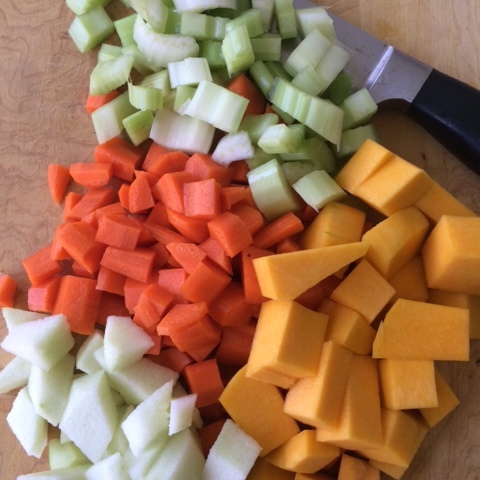 Butternut squash, apples, celery, carrot, and a few other seasonal ingredients are chopped and blended to make a heart-warming, comforting dish. Top with garlicky croutons, and chopped green onions for a pop of color and extra flavor. 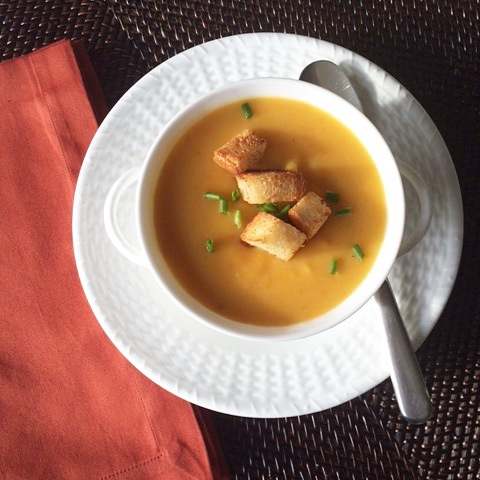 With the cool weather upon us, what better way to cozy up with a warm bowl of this Butternut Squash Soup with Apples. 1. Heat a heavy pot on medium-high heat. Melt the butter in the pot. Add the onion, carrot, and celery and sauté for 5 minutes. 2. Add the butternut squash, apple, stock and water. Bring to boil. 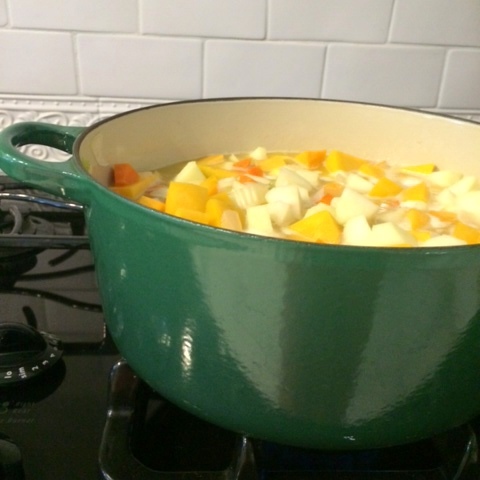 Reduce to a simmer, cover, and simmer for 20 minutes or so, until the squash and carrots have softened. 3. 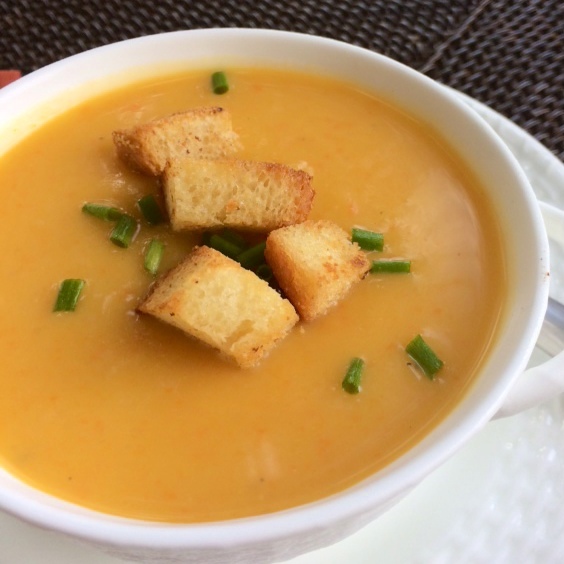 Use an immersion blender to purée the soup, or purée the soup in a standing blender. 4. Add salt and pepper to taste. Garnish with chopped fresh parsley or chives.